The USTTA film library, lost for decades, has been (mostly) recovered. It consists of about a dozen 16mm films, and countless 8mm home videos. They range in condition from excellent to rough, as they were frequently "checked out" and used by private individuals on various projection equipment. 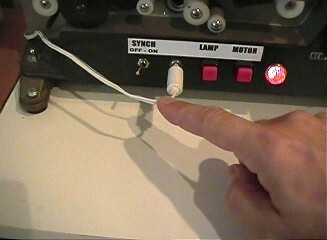 Before film can be played, it needs to be checked by hand, cleaned, and any splices repaired. In some cases, I have found it useful to repair sprocket holes using special purpose tape (shown at the right). Preparing a film for playback can be tedious if the film is badly damaged, but can make a huge difference in the quality of the transfer. Once prepared, digitizing and restoring old film can be done in a number of ways. One of the best ways is to use a Workprinter. These are projectors which have been modified to communicate directly with a computer, using a 3-CCD camera to capture each frame individually. The process is slow - 6 frames per second - but the quality far exceeds ordinary direct projection methods. The Workprinter I use is made by Roger Evans of the company Moviestuff, and is shown on the left. Although it may look like a standard projector, it is actually much more. 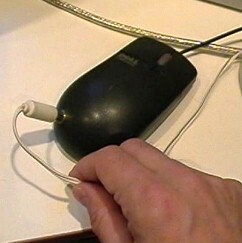 Connections with the computer are done via a special mouse, as shown below. 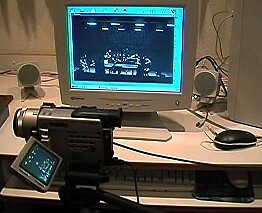 The process works essentially as follows: (1) the projector advances the film, (2) the image is projected into the video camera, (3) the projector sends a signal to press the mouse button on the computer, and (4) the computer software captures the image and appends it onto the video file. The software used is called Cinecap. Speed correction can be done using Cinecap (mentioned above). The remaining corrections are done either using standard video editing software (such as Sony Vegas) or by using one of the many Virtualdub filters available on the internet. For example, the DeShaker filter by Gunnar Thalin is particularly good at smoothing jittery video. The satisfying part of all of this effort, is that even very old film can yield beautiful images. Here are a couple of snapshots of frames taken from 16mm films - one from a 1983 world table tennis championship, and one from a 1950 drumcorps film. Neither of them have had any adjustment or correction of any kind! Some of the films are silent, but most include AUDIO. Since the video is capture frame-by-frame at a slow rate, audio must be captured separately. This is done using a standard film projector connected through an audio card to the computer. After transfer, the audio on these old films also needs considerable attention. There are often loud thumps whenever a splice or other repairs are present. Synchronization with the video can be a slow, painstaking task... at times it is even discovered that the original film was poorly synchronized to begin with! The entire process of cleaning, repairing, capturing, correcting, synching audio, stabilizing, and encoding can range anywhere from a couple of hours to several days, depending on the length and condition of the film. 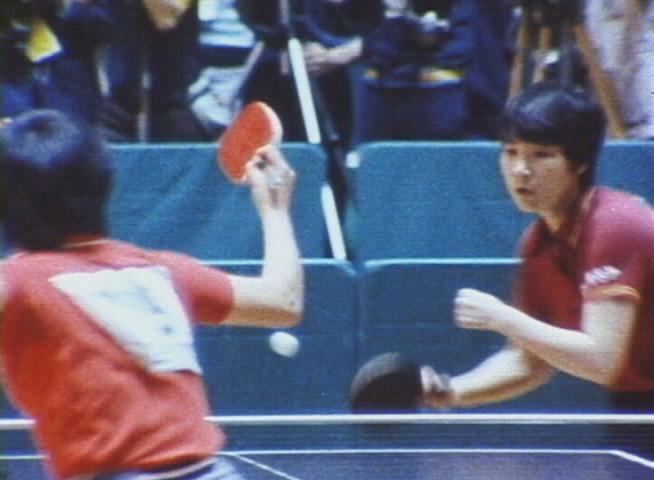 The two disks in the USTTA Historic Table Tennis Films set reflect several months of effort. dropouts - splices and edits often make for sudden jumps. audio - optical film audio is often uneven in quality. grain - many of these films were amateur efforts, and the resulting films can be grainy. 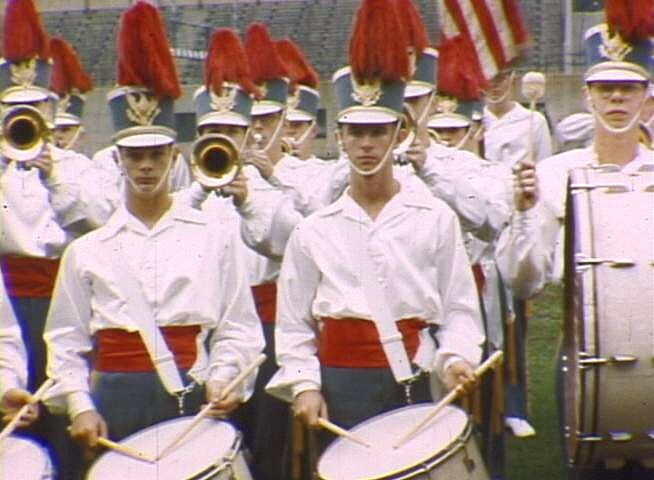 color shifting - the 1972 diplomacy film had become SO red, that repair was limited. scratches - a wetgate transfer could mask these, but the price would be prohibitive. I hope that you enjoy these historic treasures in spite of their blemishes. Each one of them posed unique challenges to restore them to a condition suitable for home viewing. Watch for future releases as I work my way through the 8mm library.